"Oh Greatness I call it Rising Boulder House." That cracked me up because he sounded like an old Indian Chief. I pictured him with a giant feathered headdress and peace pipe cleansing the house with a smudge. My father also wrote that he and the other inmates are watching Christian's sitcom "Are We There Yet?" on TBS because "other channels having nothing good on Wednesday nights." Wow, what an endorsement! But we'll take the extra viewers and be thankful that the NFL is dark those nights. Dad had some support and advice for my husband, too: "Try to get a nice trophy. Christian, keep out of the troubles with the drinks and dopes...Or I will whip your a$$ 100K times." We believe him. 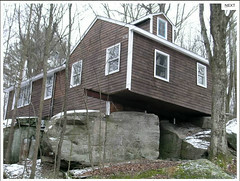 Incidentally, I posted Dad's quote about our cabin on Twitter, saying: Dad loves our new cabin which sits on two giant rocks. "Oh Greatness, I call it Rising Boulder House." I didn't know he was Native American.